Our modular dust extraction units are made up of individual sections which bolt together, this gives our clients the option of expanding their extraction system as requirements grow. Giving a cost-effective, future proof solution. All filter units come complete with an automatic vibratory filter cleaning function, the necessary control panel, ATEX certified explosion panels and an acoustic foam lined filter housing to ensure the machine runs as quietly as possible. 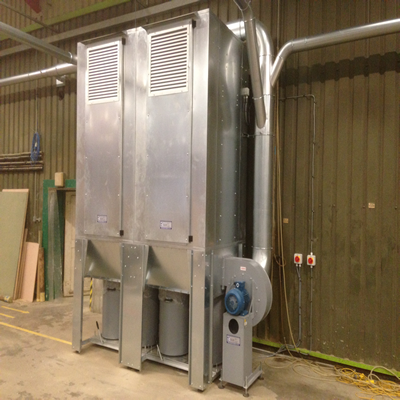 Our modular dust extraction units are manufactured from galvanised steel and suitable for use inside or outside. We are also able to supply them in the RAL colour of your choice if necessary. Each module is provided with two 150 litre collection bins as standard. 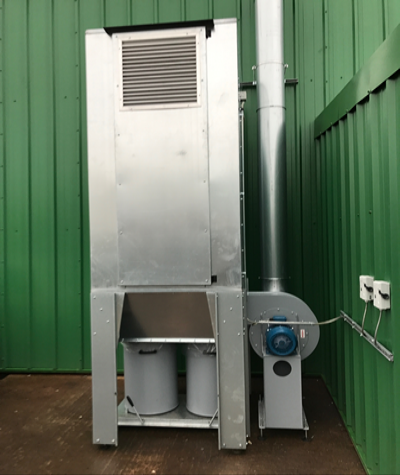 Filter units can be mounted on framework and fitted with rotary valves and transfer fans to allow waste to be collected in a silo or skip configuration. Fans are available from 0.55kw to 40kw. Each fan is supplied to suit the requirements of the system and multiple fan configurations are available.